Contributions by the artists Clegg&Guttmann, Muntean&Rosenblum, Rudolf Polanszky, Tamuna Sirbiladze and Franz West. 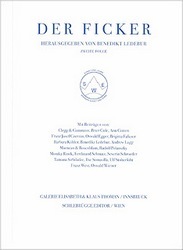 The yearbook “Der Ficker” is appearing in its second edition. It was conceived last year by Franz West, Clegg & Guttmann, Benedikt Ledebur and Rudolf Polanszky as a philosophical-poetic, artistic, new edition of the famous Innsbruck “Brenner”. In this year’s edition the circle of artists and authors influenced by Wittgenstein has been expanded. In April 2006 the Wittgenstein Haus in Vienna will serve as the venue for events (exhibition, lecture series) accompanying the publication of the new “Ficker”.